When I’m stressed, when things aren’t working out right, when relationships are strained, more than anything, I want peace and serenity. I want to relax. I sometimes want everyone just to get along, and at other times, I just want to be alone to follow both personal and spiritual pursuits without interruption and distraction. So midrash aside, I can very much empathize with Jacob’s desire for peace and serenity. But I think Rashi, as interpreted by Rabbi Pliskin, has a point. We weren’t put here by God to seek peace and serenity, we were put here to serve Him. Serving God is rarely very peaceful. Just look at lives such as Abraham’s, Jacob’s, Joseph’s, Moshe’s, David’s, Jeremiah’s, and of course, our Master Yeshua’s (Jesus’) life. Also consider the apostles, particularly Paul. Was their service in spreading the good news of the Moshiach to the Jews and to the nations particularly peaceful? Most of the time, it was ultimately fatal in a violent and premature sense. May God not wish me to serve him in such a manner for I know my faith and trust pale in comparison to even the least of the Biblical tzaddikim (righteous ones or “saints”). But R. Pliskin said “growth, not serenity,” which I take to mean that rather than seeking peace, we should be seeking to experience our lives as the platform upon which we strive to grow spiritually, to grow closer to God. This means that regardless of our circumstances, good or bad, we should approach the experience in the same manner, as a test or a “training session” designed to assist us in becoming more spiritually elevated. Of course, to be in a position to look at everything from ecstasy to agony in this way probably requires that we be in a fairly elevated state already. I don’t think I’m there yet, but maybe being aware that it’s possible will give me something to shoot for. If the ancient and modern Rabbinic sages can apply this principle to Jacob, I think it’s reasonable to apply it to Paul as well. This gives it a more universal usage which means it comes right back to my front door, so to speak. The goal of trust and faith in God and living a holy life then, is not to find peace in our circumstances, but regardless of what is happening to us, to find peace in God as Paul did. Anyone viewing the scene of Yosef being brought down to Egypt as a slave would have considered it a major tragedy. His brothers sold him into slavery and he was being taken far away from his father and his homeland. But the reality was that this was the first step towards his being appointed the second in command of Egypt. He would eventually be in charge of the national economy of Egypt and would be the mastermind behind the complex program to prepare for the years of famine during the years of plenty. Being limited, temporal beings, our major focus is what is happening to us right now or what has just recently occurred. If it’s something unpleasant, then we tend to believe that it is also undesirable. 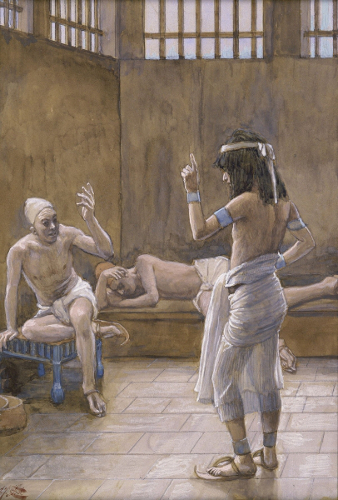 Joseph probably felt that way when he was being sold into Potipher’s household and certainly would have that experience upon being sent to prison. If only you would think of me with yourself when he benefits you, and you will do me a kindness, if you please, and mention me to Pharaoh, then you would get me out of this building. For indeed I was kidnapped from the land of the Hebrews, and even here I have done nothing for them to have put me in the pit. After two years in prison, Joseph’s words give us no indication that he was viewing his continued incarceration as anything but a miscarriage of justice, and an unfair and unpleasant circumstance. He had not “learned to be content in whatever circumstances” he found himself in. With great respect to the Rabbis, I don’t think midrash sufficiently describes Joseph’s personality or spirituality. While he did indeed have great faith and trust in God, he really wanted to get out of prison and he was willing to ask for help from a potentially influential person, a bit of quid pro quo, as it were. Perhaps Joseph realized what God had done in retrospect, but it doesn’t seem that he realized it when he was still locked up. Nevertheless, we shouldn’t lose sight of the fact that Joseph acted with utmost integrity and morality, both as a slave and as a prisoner. If he had given up hope and surrendered to despair, engaging in the baser behaviors of a prison inmate, then he certainly would not have been in position to take the next step in God’s plan.